No reason Adams can't be skied enjoyably in early July. I skied it last weekend of June last year and it was still primo - carried less than a mile, skinned to the summit, SW chutes skied great. It likely would have lasted at least 2-3 more weeks in good conditions, longer with more hiking/more suncupped skiing. 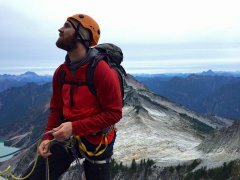 I feel like I say this all the time to people starting out in mountaineering, but I believe Adams (and volcano/backcountry skiing in general) deserves a little more respect than it often gets. I don't know what your mountaineering background is - maybe you've got years of experience. If so, feel free to ignore my advice. If not, I think you should be at least a little concerned about routefinding - it's not terribly complicated, but simple mistakes can have big consequences on a big mountain. You should definitely still be knowledgeable and concerned about the potential for wet avalanches. They can still happen in summer - especially on steep terrain like the SW chutes. And you should be aware that the hazards of climbing and skiing a big mountain aren't the same as those of skiing in a resort, no matter how challenging the resort terrain may be. A week before I skied it last year it was an ice skating rink and several people took big, high speed slides with serious injuries. I don't say any of this to be discouraging - it's an amazing ski trip, absolutely one of my favorites, and you should totally have a go at it. Just give the trip the respect it deserves. Also - no one else has really said it, but I know my feet/legs would absolutely hate me if I tried doing a 7k foot, 10 mile day as my first day ever, in rental boots no less. Maybe I'm a pansy, but a day like that still wears out my hip flexors and threatens blisters even in well-fitting, well broken in boots after I've put in 30+ days and 60k feet in a season. Skinning can either be a really efficient means of travel, or it can be extra exhausting, depending on your technique. I'd take some other folks advice and do a shorter, easier day a little earlier in the season to figure out the mechanics of things, then go out for a fun day on Adams in late June/early July. Selling Tenaya Masai in size 12.5. If you aren't familiar, they are very similar to a 5.10 Anasazi, but with a better fitting heel cup. These shoes are in near-new condition, worn for maybe a dozen pitches. Uppers and insides are clean and look new. Rubber is at 90%, lots of life left before a resole is needed. Includes a second set of laces, one red and one black. Pics here- http://imgur.com/a/9hp0y They retail for $140. I was thinking $90 or so. Rough. My thoughts are with the family and friends of the victim and his partners. I was camped at Colchuck lake when the accident happened last year. I thought then, and I'm thinking again now, that I can't help but wonder if there are some factors at play that have lead to increased accidents in the Enchantments in recent years. The FS changing the permit season to May 15, has in my experience greatly increased the number of people headed into the area in early season. I think a lot of people with less familiarity with the area take the fact that permit season is open to mean that the hiking route is open for the season. Most of us know that Aasgard pass in spring is far more similar to a mountaineering route than it is to a hiking trail. Couple that with a 'scarcity' human factor (fueled by permits, short weather windows, and the non-stop bombardment of beautiful adventure photos on social media) and I think frequent accidents are somewhat inevitable. I'm not really sure what the proper course of action is, or even if there is one. I know I would bemoan the loss of wildness if someone went up and put signage or wands warning folks away from the skiers left side of the pass. Changing the permit dates back would just lead to more people, I'm afraid. It's a sad shame that this is such a frequent occurrence. See my post for BD Contact Strap Crampons - Let me know if you're interested. Happy to ship at whatever speed you want - you pay shipping. tobinstory@gmail.com if you're interested. Used pair of BD 10-point crampons for sale. Moderate use, good shape overall. No rust, points are relatively sharp, and all hardware is good. Just reducing some redundancy in the gear closet. $75 pick-up in the Seattle area. question Women's Weather/waterproof Belay Jacket? question AT Ski Width Recommendation? It's helpful to think about when/where you plan to ski most. We really have two seasons of skiing in the Cascades. Midwinter skiing when you'll ski primarily powder (I wish) and other soft/unconsolidated snow, and spring/summer skiing when you're mostly skiing corn. A wider ski will be beneficial for most midwinter skiing. 100-105 is a good width for a daily driver in winter conditions. Good flotation for deep snow on the uphill and down, tends to float on top of crappy snow conditions, but not so wide that they're difficult to keep in the skin track or cumbersome on the down. I'm currently on some 115s and they're honestly a bit too wide for all but really deep days, will probably switch back to a 105 soon. Narrower will be better for spring skiing - lighter weight, better edge to edge performance, easier to drive in firm snow. I think 90-95 is a good width for those, that way you still have some flotation for when the snowpack hasn't fully consolidated. You can certainly get by using one ski for both conditions, I'd just buy for whichever conditions you're likely to encounter more. Looking to borrow SNOWSHOES this wknd for my Mom! If DPS doesn't work, send me a message. I'm eastside and have a pair you can borrow. Bump for price drop. Yours for $300 for Seattle/Eastside pickup, or you pay shipping. Size 46 Scarpa Mt Blanc Pro, in near new condition. Bought in August, worn for one attempt on Kautz, soles and leather have very minor scuffing from that trip. All yours for $375 for local (Seattle or Eastside) pickup. Any of you guys looking to get out and climb somewhere tomorrow? Thinking Exit 38 or Index, but I'd also be game for Darrington or elsewhere.